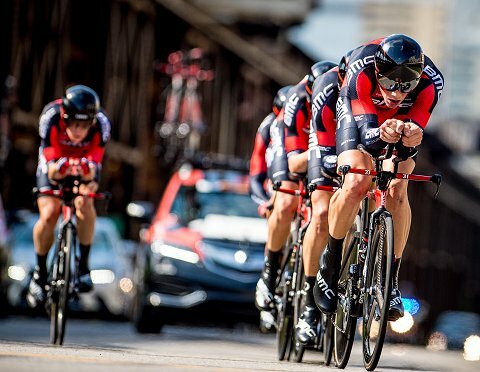 Richmond, Virginia – The BMC Racing Team led through every time check Sunday on the way to capturing its second straight UCI world team time trial championship. Powering its BMC timemachine TM01s through the streets of Richmond, Virginia, the BMC Racing Team averaged 54.969 kilometers an hour to best Etixx-Quick Step by 11.35 seconds. Movistar Team finished third, 30.11 seconds off the winning time of 42:07.97. Members of the winning team were Rohan Dennis, Silvan Dillier, Stefan Küng, Daniel Oss, Taylor Phinney, Manuel Quinziato. Phinney, who only recently returned to racing after being sidelined by a major injury for 62 weeks, called it “a nearly perfect” performance. In addition to winning on Sunday, the BMC Racing Team also captured team time trials at the Vuelta a España, the Tour de France and the Critérium du Dauphiné this year. BMC Racing Team Trainer Marco Pinotti said he was initially worried the squad started too fast. At the first time check at 10 km, the BMC Racing Team led Etixx-Quick Step by nearly four seconds, ORICA-GreenEDGE by nearly five and Movistar Team by almost nine. “It was fast and I did not expect to be that much in front of the other teams,” Pinotti said. 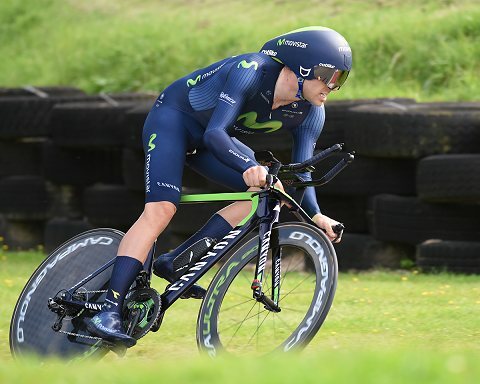 For Britain, Alex Dowsett (British TT Champion) there was a bronze medal for him and his Movistar teammates. On twitter Alex said “Well that went well. Pretty special sharing the worlds podium with my @Movistar_Team mates”. 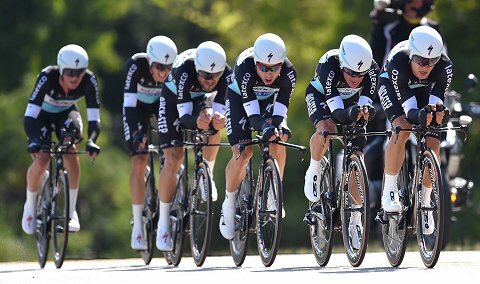 Etixx – Quick-Step placed 2nd in the 38.8km UCI World Team Time Trial Championship on Sunday in Richmond (USA), 11.35″ down on winner BMC Racing Team (42:07.97). BMC Racing Team passed through all three checkpoints fastest, but by the third time check their advantage was down to about five seconds. BMC Racing Team averaged 55.275km/h, while Etixx – Quick-Step averaged 55.014 kilometers per hour. Movistar, who earned Bronze in the event, crossed the finish 30.11″ down. “I’m very happy with the performance of the team and my own performance,” Tony Martin, three-time UCI World ITT Champion, said. “We started well, we found a good rhythm, which was in my opinion not too fast and not too slow. We were balanced as a team, with no super strong or weak riders. It was smooth, as it should be in a team time trial”. Matera, Italy, 20 September 2015 – Velocio-SRAM won their fourth consecutive team time trial World Championship today in Richmond, USA. The team crossed the line in a time of 47:35 to beat Boels Dolman by 6 seconds and RaboLiv by 56 seconds. Velocio-SRAM had the fastest time at the first two intermediate time checks, narrowly ahead of Boels Dolman. It became clear it would be between these two teams for the first gold medal on offer at the UCI Road Cycling World Championships. At the third and final intermediate time check, the Dutch team had turned the tables on Velocio-SRAM to lead by just over three seconds. In an amazing team effort, and calculated tactics by Sports Director Ronny Lauke, Velocio-SRAM was able to regain the lead on the final climb to take victory in downtown Richmond. The winning team was Trixi Worrack, Barbara Guarischi, Mieke Kröger, Karol-Ann Canuel, Alena Amialiusik and Barbara Guarischi. For Britain’s Lizzie Armitstead, there was a silver medal with the British Women’s RR Champion saying afterwards “Thanks to @iamspecialized for giving us the the best opportunity to go fast,almost but no cigar!A proud silver in the worlds”.